Greetings! I thought it was time to post my first devlog here on itch.io and give you a little update on City Clickers and how things are progressing. A lot of work has gone into the game since last release, much of it scrapped or reworked again just to be discarded too. That's iterative game design for you. The goal has been to keep the game simple to play while offering much more to do compared to the original release (I shall refer to it as City Clickers Classic). There is still plenty much to do to reach that goal but I feel it's getting there. So let's go back a little and see what was added. Shortly after the last release in May 2017 I started implementing water. The concern was the map was too uniform and boring. Bodies of water helped break the monotony and also provided little rating bonus to houses built near it. That small feature was released in a beta build. In the current version, water is basically the same but I'm hoping to add a few structures that require to be built on water (like a marina). Water is also prone to be polluted and carrying the pollution further. You can also raise water to be terrain and vice versa, but these operations are quite costly, hopefully forcing the player to build around the water rather than just bulldozing it and considering it no obstacle. First of all, instead of considering jobs and shopping as a requirement (affecting housing rating), I made it so that people would still move in even if these conditions weren't met. You as a player would just miss out on generating additional income and sales tax. This means people can move into houses without having to perform these checks. Secondly, water usage still posed a problem. It was solved allowing water tower / pumping station usage to exceed 100%. But this is something you want to avoid as buildings now have a condition property, and overusing resources like that will quickly lead to expensive breakdowns. In addtion to connecting houses to water, they now have to be connected to electricity as well. For that you need to first build a power plant (highly polluting) and then electrical substations around city. Substations behave just as water utilities. They can be overused potentially resulting in a fire. During the summer, a warehouse building was implemented. Use of this structure is pretty straightforward. In order to produce anything, you need to store it somewhere. So your production capacity is limited by storage capacity. Not a big impact on the game, but warehouses are somewhat polluting with all the trucks coming and going, so it's optimal to keep them separated somewhere. This need of keeping some structures separated from others lead to another addition. Paved roads are expensive. Expensive to build and expensive to maintain, especially when you want to branch and distance out. So to counter that gravel roads were implemented. These are cheap to build and a lot cheaper to maintain and when starting out, this is basically all you should build. They have a few drawbacks however. Dust being the main culprit, so people are not so keen living next to them. Don't even think building middle or upper class residents along these roads. In September a new structure was added. Food production was separated from factories and now farms can be built. Farms require some farmland around them to be effective, you need to be careful where you place these. These towers have pretty large range but anything outside it, you have no real-time feedback on. Additional towers can be built but they're pretty expensive, so their placement becomes key. Regarding houses and ratings for different classes, a lot more auxiliary buildings will be added that you need to boost ratings for higher class residents. Anything from schools, libraries, sporting pitches and golf courses to cinemas and museums. Buildings also now have distict visual differences based on housing class. Previously, all buildings used the same sprites. 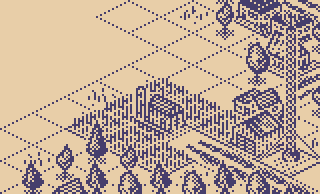 While the game still essentially has 1-bit graphics (all assets are drawn using just two colors), outside the 1BitJam this look is not very pleasing on the eyes. Especially as the city gets larger and the screen gets busier. 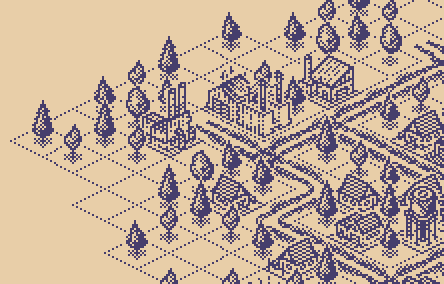 Not wanting to fundamentally add any more colors to assets nor lose the option of drawing it in 1-bit, I turned to post-processing shaders. Using simple neighbouring pixel checks, it increases the palette up to 6 colors. This had a major impact on the visuals and readability. Simply put, I'm loving the new visual style. It's especially noticable when switching between the two modes (which is still an option in the game). In addition to changing how houses and resources are connected, some of the fundamentals have been changed. Largest change is, that builds and overall time now progress on their own, albeit very slowly, so you can click to speed things up. The game felt very static previously so I think it's a change in the right direction. Another change is, that you can have more than one build ticking along concurrently, but I'm still wondering how player can unlock that. Either through some structures or maybe an option to select construction contractor (each witch different stats). We'll see. It is still subject to change, but this is what is planned- in standard mode, the game is broken into 10 levels (levels in abstract sense, not separate maps or aything like, let's say, Theme Hospital). Each level has different goals you need to meet. Once met, next level is unlocked, resulting in access to new buildings and gameplay features. You have 50 years to finish all these levels to complete the game. Now, there are a couple of ways you can lose. First by not finishing level 10 by year 50, secondly by bankrupting your city beyond salvation or simply doing such a bad job that you'll be forced to resign. That last option however will not result in a game over and there will be a way to continue on. You'll see. Approval ratings are now a thing. Through taxes and other actions you can shape your approval rating in all different social classes. This is important because in order to keep on playing, you occasionally have to win elections. Election results will basically be decided based on your actions over the last 4-5 years, with the last year weighing in on the opinion a bit more, as it is in real life. Past sins are often forgotten come election time. With silly little random events and choices thrown in, this will hopefully make up an engaging game in the end. Of course, you will still be able to play in sandbox mode where all buildings are unlocked and a lot more can be customized. City Clickers has, even now in its sad early state, done way better than I expected. It's got over 30k downloads and nearly 80k views here on itch.io, which is really wild for me. I've lost count on Let's Play videos about it on YouTube. 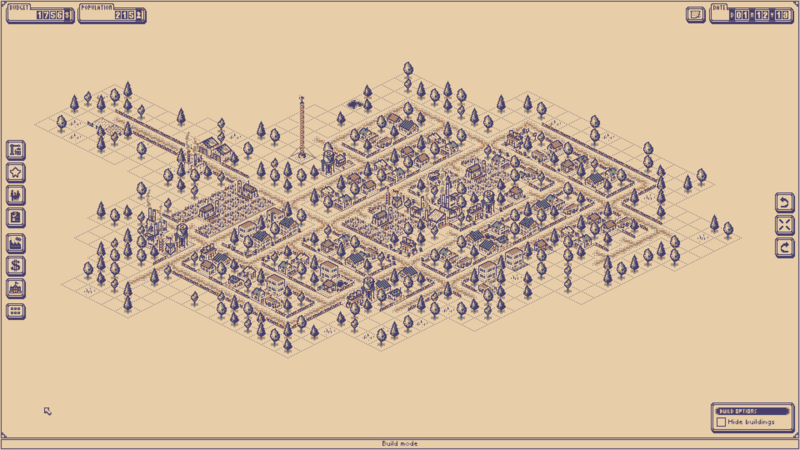 There is definitely room for a small city builder out there! That's it, I think. Thank you very much for reading! I've gotten some extremely useful feedback from you all, be it forum posts or gameplay videos. If there's anything I forgot to write up, I will definitely add it. And if you have any questions, please ask!